PRESERVATION has been key to the removal of several buildings, trees and historic iron gates to make way for an $80 million, 198-room tourist development. Plans are slowly progressing for the Yarroon St development, which was given final council approval in June last year. The Observer first reported on the application when it was lodged with the council last March. Clearing the site and flattening the land finished on Tuesday, and it was a key step for developers in the process of finding investment. Despite still seeking investment for the project, developer Martin Gleeson said he believed there was a need for the hotel. "The negotiations are still ongoing. It's a big project and can't be rushed," he said. "You've got to look at a broader market place (than construction residents), I reckon that's tourism." If it goes ahead as planned, it will be Gladstone's largest hotel complex. "(The business) will carry on for more than 50 years, 100 years even." He said the cost of a development was much lower now than it was during the "boom". "If the smart investors invest at the bottom level - now - the potential is much better than when it was booming," he said, adding the $80 million price tag would just be the cost of construction, and did not include furnishings. 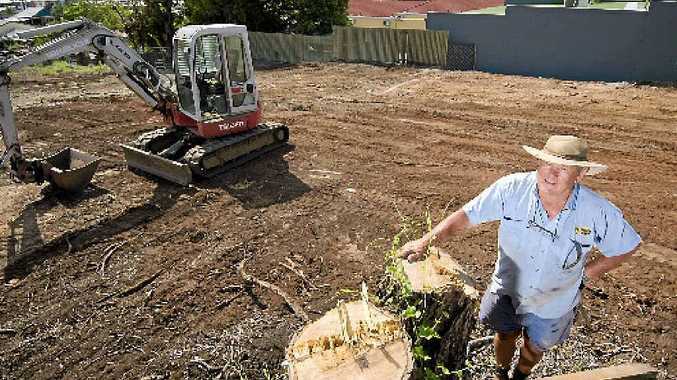 Mr Gleeson and his crew were able to preserve the 28 Yarroon St Queenslander-style house, cutting it in half and sending it down to start a new life in Bundaberg. "The whole fence has been saved - a local man is going to buy it and restore it," he said. "The gate - we have that. It's been put away and preserved." Mr Gleeson added that a local artist had taken several of the big trees - the Jacaranda, Turpentine and another tree, hardwood and hoop pine - to make artistic work-carved pieces.